​He completed his undergraduate degrees in both Music Education and Music Performance at Michigan State University. He has performed with ensembles including various ensembles at MSU including the Wind Symphony, the Philharmonic Orchestra, and the Steel Drum Ensemble. He was a featured soloist in Spring 2013 with the MSU Symphony Orchestra. 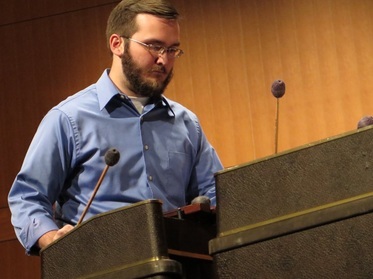 Jon has performed with the MSU Percussion Ensemble at various national percussion conventions and festivals including the annual Percussive Arts Society International Convention and the McCormack Marimba Festival. Jon also performed with the nationally renown Spartan Marching Band for three years as a member of the drumline. He has taught a summer percussion program at the Flint Institute of Music. In addition, Jon has also taught various high school drumlines throughout Michigan. His professional affiliations include Texas Music Educators Association, Texas Bandmasters Association, and Percussive Arts Society.